In this Adobe Photoshop Tutorial I will show you how to edit a damaged image and repair it using the Clone Stamp Tool, the Spot Healing Brush Tool and the Patch Tool. We will also look at how we can use selections and layers to repair parts of the image. Mark Williams is the Director of Creative Studios Derby LTD, the East Midlands largest and most experienced Adobe training centre. If you need help learning any software from the Adobe Creative Suite, then contact us. 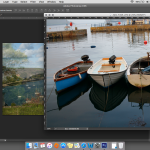 We regularly run Adobe Photoshop Training Courses from our state of the art studio in Derby.